I’ve recently become interested in hosting my own local S3 API compatible object storage server at home. So tonight I set about setting up Minio. 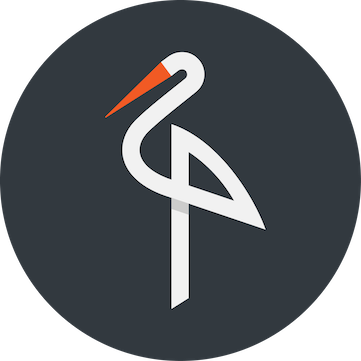 Minio is an object storage server that is S3 API compatible. This means I’ll be able to use my working knowledge of the Amazon S3 API and tools, but to interact with my own, locally hosted storage service running on a Raspberry Pi. I had heard about Zenko before (an S3 API compatible object storage server) but was searching around for something really lightweight that I could easily run on ARM architecture – i.e. my Raspberry Pi model 3 I have sitting on my desk right now. In doing so, Minio was the first that I found that could easily be compiled to run on the Raspberry Pi. Being able to write scripts that interact with S3, but test them locally with Minio before even having to think about deploying them to the cloud. A local object storage API is going to be free and fast. Plus it’s great knowing that you’re fully in control of your own data. Setting up a publically exposable object storage service that I can target with serverless functions that I plan to be running on demand in the cloud to do processing and then output artifacts to my home object storage service. The second use case above is what I intend on doing to send ffmpeg processed video to. Basically I want to be able to process video from online services using something like AWS Lambda (probably using ffmpeg bundled in with the function) and output the resulting files to my home storage system. The object storage service will receive these output files from Lambda and I’ll have a cronjob or rsync setup to then sync the objects placed into my storage bucket(s) to my home Plex media share. This means I’ll be able to remotely queue up stuff to watch via a simple interface I’ll expose (or a message queue of some sort) to be processed by Lambda, and by the time I’m home everything will be ready to watch in Plex. Normally I would be more interesting in running the Docker image for Minio, but at home I want something that is really cheap to run, and so compiling Minio for Raspberry Pi makes total sense to me here, as this device is super cheap to level powered on 24/7 as opposed to running something beefier that would instead run as a Docker host or lightweight Kubernetes home cluster. You’ll basically download Go, extract it, set it up on your path, then use it to compile Minio’s source code into an ARM compatible binary that you can run on your pi. And you’re up and running! It’s that simple to get going quickly. Of course at this stage you can also start using your S3 API compatible command line tools to start working with your new object storage server too. I am a big fan of HP’s Microserver range. 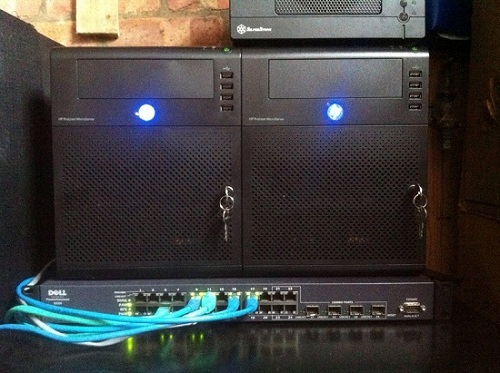 They make for excellent home lab hardware, and I currently have 2 x N40L models running a small vSphere 5.1 cluster for testing, blogging and study purposes. 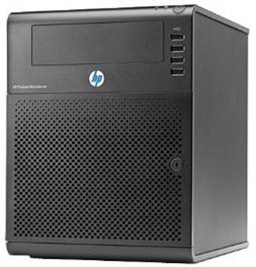 It looks like HP have now officially listed their new Microserver range on their website – the N54L. The most notable change seems to be a much beefier CPU. The original N36Ls had a 1.3GHz AMD processor, with a slight improvement to 1.5GHz on the N40Ls. The CPU has always been the weak point for me, but has been enough for me to get by on. So the N54L models are now apparently packing 2.2GHz AMD Athlon NEO processors. This is a fairly big clock speed improvement over the N40L range and should make for some good improvements for those using these as bare metal hypervisor use. I have always enjoyed running my own home lab for testing and playing around with the latest software and operating systems / hypervisors. Up until recently, it was all hosted on VMware Workstation 8.0 on my home gaming PC, which has an AMD Phenom II x6 (hex core) CPU and 16GB of DDR3 RAM. This has been great, and I still use it, but there are some bits and pieces I still want to be able to play with that are traditionally difficult to do on a single physical machine, such as working with VLANs and taking advantage of hardware feature sets. 250GB local SATA HDD (just used to host the ESXi installations. 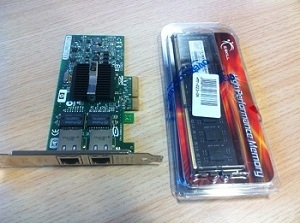 As mentioned above, I am using HP NC360T PCI-Express NICs to give me a total of 3 x vmnics per ESXi host. 1Gbit Powerline Ethernet home plugs to uplink the Dell PowerConnect switch to the home broadband connection. This allows me to keep the lab in a remote location in the house, which keeps the noise away from the living area. This is a work in progress at the moment, (currently finding the low end 2 x bay home NAS devices are not sufficient for performance, and the more expensive models are too expensive to justify). As this is temporary, each drive provides 1 x Datastore to the ESXi hosts. I therefore have one large datastore for general VMs, and one fast SSD based datastore for high priority VMs, or VM disks. I am limited by the fact that the Micro-ATX board only has 2 x onboard SATA ports, so I may consider purchasing an addon card to expand these. Storage is presented as NFS. I am currently testing ZFS vs UFS and the use of the SSD drive as a ZFS and zil log / and or cache drive. To make this more reliable, I will need the above mentioned addon card to build redundancy into the system, as I would not like to lose a drive at this time! Currently, one host only has 4GB RAM, I have an 8GB kit waiting to be added to bring both up to 8GB. I also need to add the HP NC360T dual port NIC to this host too as it is a recent addition to the home lab. 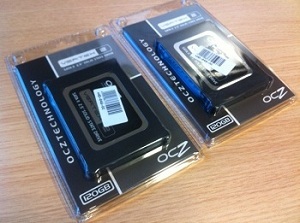 On the storage side of things, I just managed to take delivery of 2 x OCZ Vertex 2 128GB SSD drives which I got at bargain prices the other day (£45 each). Once I have expanded SATA connectivity in my Micro-ATX FreeNAS box I will look into adding these drives for some super fast SSD storage expansion. Lastly, the Dell PowerConnect 5324 switch I am using still has the original firmware loaded (from 2005). This needs to be updated to the latest version so that I can enable Link Layer Discovery Protocol (LLDP) – which is newly supported with the VMware vSphere 5.0 release on Distributed Virtual Switches. This can help with the configuration and management of network components in an infrastructure, and will mainly serve to allow me to play with this feature in my home lab. I seem to have lost my USB-to-Serial adapter though, so this firmware upgrade will need to wait until I can source a new one off ebay. Just a quick post today on RAM compatibility with the good old trusty home lab server, the HP Proliant N40L Microserver. I am currently using Microservers for my home vSphere 5 lab, running ESXi 5.0 update 1. I had 8GB of Corsair XMS3 PC3-12800 C9 (1600MHz) RAM lying around at home and wanted to put it back to good use. It does not have ECC, but I tried it out in my Microserver and it works! Despite being a higher voltage rated RAM kit (1.65v odd), it works with the Microserver’s 1.5 rated DIMM slots just fine. No need to buy an extra 8GB RAM kit with my second Microserver now. 978 days, 4 hrs and 1 min.